There are a number of different, basic, and easy, approaches to winning at Backgammon. It may not always be the best idea to charge forward 100% and hit your opponent at every opportunity. On the other hand, many newcomers may also have a tendency to avoid being hit at all costs. Learn the best backgammon strategy online by reading through our best backgammon strategy tips below. Know the probabilities of being hit and calculate risks. In the list and descriptions we've presented below, you will find a selection of different aspects of the game which need to be considered when determining your general approach. Familiarize yourself with the concepts and constantly revaluate during the course of your games in order to optimize your backgammon strategy. Distribution is how evenly your checkers are spread around the board, and whether they are placed in advantageous positions providing the highest amount of options for each dice combination. 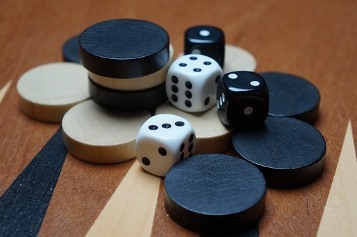 A player with even distribution will often appear to get lucky rolls because he is able to choose the best possible move from a variety of sound alternatives. Having five or more checkers on a single point is often considered 'bad' distribution because it limits your flexibility and often results in a forced play. One thing many beginners worry a lot about is leaving shots. Any professional will tell you that leaving shots, however, is absolutely essential when trying to establish a particular type of game, but you need to consider when and where to leave them. Be careful when your opponent's home board is strong or has such potential. The more points that are made in his home board, the more difficult it will be to escape. Leaving shots early in the game involves less risk. On the other hand, if you have made several points in your home board, you have the benefit of being able to play more aggressively. And, if you are ahead in the race, try not to expose any blots, as you want to preserve your lead and keep your opponent out of the game. If you manage to get good rolls early in the game and are able to escape your back checkers (for example, an opening roll of 6-5 followed by a 6-4, or 6-3) you should immediately launch a 'running game'. You have an early advantage in the race, and by continuing to move your checkers forward as quickly as possible, you are hoping to utilize that advantage. Running is only suggested, however, when you already have a substantial pip-count lead, or at the initial stage of the match where you roll good numbers (for example double-5s, or double-6s). The Blocking Game is used primarily when your opponent has thrown much better dice than you, and your only hope of winning the game is to keep a few checkers back and wait for a blot, hoping to prevent your opponent from getting out of his home board. Therefore, it is necessary to build a prime, which will trap your opponent when the time comes. This strategy is defensive and requires fortunate dice rolls, but remember: luck is a huge part of the game! The Back Game is not exactly a strategy but more of a last-ditch/Hail-Mary effort to win the game from a notable disadvantage. The chances of winning from a back game are not great, but it can happen. This type of game should be reserved for desperate situations. Setting up a back game involves establishing 2 or more defensive anchors with the purpose of holding the points for as long as possible, causing your opponent to bear in awkwardly and expose a blot. When the blot is hit, the idea is to contain it behind a prime and close out your opponent. The back game can be a very effective way to win a gammon or backgammon, if the dice fall in your favor and it is correctly executed. Anchoring is one of the key strategic positions in backgammon. It means simply establishing a defensive point in your opponent's home board. Mastery of anchor placement is essential because it enables you to safely re-enter the board when hit and prevents your opponent from making his board in preparation for bearing off. Early in the game, you should try establishing anchors on the higher points (20,21; also called 'advanced anchors'). If you find yourself significantly behind in the race, the lower points (22,23,24) should be targeted for anchor placement as your strategy is to build your home board and wait for a shot. When playing this type of game, two anchors on adjacent point can be very functional. No, this doesn't refer to 'talking' but, instead, it means distributing your checkers so that they are kept within six pips of each other in order to ensure that a checker may be covered at a crucial stage. A wide separation in checkers leads to a weakness, which your opponent may exploit. Equal parts luck and skill, the game of backgammon is attractive to all kinds of people. In other words, it's possible for a newcomer to even beat a pro if he/she gets lucky with the dice. Such precariousness can't be found in other games such as chess or checkers. Of course, an experienced player will nearly always emerge as the victor in any series of games, but regardless, the luck factor is what draws many new players to backgammon. Accordingly, in order to improve as a player, one must understand this luck factor. By comprehending the numbers involved and knowing the correct chances of a certain number coming up, you place yourself in a better position to make the correct decisions necessary for victory. Your checkers are often exposed to the possibility of being hit. A player who understands the probability, and can account for the degree of risk, is in a better position to decide when and where to expose such pieces. "Odds" (a.k.a. 'probability') are defined as the ratio of probability that something will occur. Put differently, at some point in a game a player might discover that a pair of 5s is exactly what is needed to execute some plan, or capitalize on an opponent's vulnerability. The odds of rolling a pair of fives are calculated as follows: There is a 1 in 6 chance of a rolled die of showing any one digit. So, in order for any two particular digits to be rolled, you must multiply the odds of each event occurring. For example, 1/6 X 1/6 = 1/36, or 35 to 1. As you can see, the chances of rolling double-5's are not very high and, consequently, you shouldn't count on this occurring. A die has 6 sides and so, 6 possible outcomes, ranging from 1 to 6. When rolling two dice, you'll have 36 possible outcomes, (6 X 6 = 36) which are referred to as dice combinations. As you can see from the 36 dice combinations, the chances of rolling any particular doublet (for example double-fives) are the same; 1 in 36, or 35 to 1. (NOTE: The combinations in blue are the desired outcomes). Now, there are two possible dice combinations with which you can achieve your goal. Your odds of hitting this combination have thus doubled; 2/36, or 17 to 1. Along the same lines, consider the following: at an important stage of the game, you find yourself exactly 7 pips away from a crucial blot, with none of your opponent's checkers separating your men and the exposed blot. What are the odds of rolling the necessary digits now? Here you can see the odds have risen substantially in your favor, compared to the previous two scenarios. You now have a 6/36 (5 to 1) chance of rolling a seven. Now, consider a situation in which you need only one particular digit to execute a plan, for example a one. Examine the table to determine the odds. The final scenario to consider occurs when you are within 6 pips of an important position, and how you roll the dice plays no role in how you get to that position, whether it be a combination or a single digit. For example, one of your checkers is 5 pips from a crucial point (or blot). Look at the table to determine the odds of rolling the needed number. Below, we've indicated the odds for rolling the correct dice combinations, which bring your checker back into the game, depending on the no. of points covered by your opponent. Remember this is when you have only one checker on the bar; when you have more than one the odds of re-entering two checkers increase significantly. As you can see, there are 29/36 combinations (80.1% chance) that will result in victory. Not bad. Now, let's consider the alternative; leaving checkers on the 3- and 2-points. Here the chances of getting a good roll are only 25/36 or 69%, so it is clear that the first option is better. If you think about it in percentages, by leaving the remaining checkers on the 4- and 1-point rather than the 3- and 2-point, you have increased your chances of winning by 11%! As you can see, being familiar with the odds, which takes some practice, can make decision-making much easier and fruitful! Whenever the useable combinations are greater than 18/36, then the probability is more than 50% that the outcome will be good for you. So, in this case, the player will know that there is a more than even chance of an immediately successful roll and that over a period of time (a game, for example) successful outcomes must occur more often than not. With all of this in mind, you can see that your chances of success in backgammon can be greatly improved with a solid understanding of the odds involved. And, hopefully, you've seen here that such calculations aren't too difficult to make and with a bit of practice, such an understanding can easily be added to your bag of skills. Do I have to play using a blackjack strategy? Although you may not win at blackjack every time, using backgammon strategy can certainly help you to improve your chances at winning the game. Is it possible to practice strategy before playing for money? If you want to get a hang of the game before playing for money, then the best thing you can do is practice the backgammon free game at the online casino you play at. Do I need to know the backgammon rules before I play? It’s always wise to brush up on the backgammon rules before going right in and playing for money. Of course you can always try playing without knowing the rules, but the probability of you losing will be a little bit higher! Can I play online backgammon with an online casino bonus? This will depend entirely on the online casino you are playing at. Most bonuses are tied to playing specific games, so check which bonuses they have available that are tied to the online blackjack game. 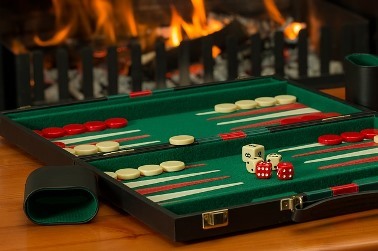 Now you know the ins and outs of backgammon strategy it’s time to start playing online! Pick an online casino from our toplist on this page – featuring the best online casinos to be found on the internet – and you can use your backgammon skills to play for money.